As the food starts getting chunkier, here are some tips and advice to help make the transition super-smooth. Introducing solid foods can be a fun time for you and your baby, with so many new tastes, textures, and flavors. At this stage, you also might be balancing work and home life, too. All of these changes will inevitably lead to questions. Here is some information to help you make this exciting transition go smoothly. As always, talk to your healthcare professional before you begin. According to the American Academy of Pediatrics, solid foods can be introduced at about 6 months old. At this age, babies learn to use their tongue to move food to the back of the mouth, and mouth reflexes are developed enough to let them swallow solid foods. 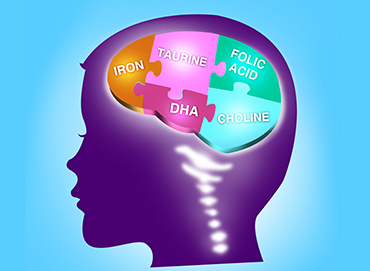 Introduction to solids prior to 4 months is associated with increased weight gain and adiposity, both in infancy and early childhood. If food is introduced later than 6 month of age this may increase the risk of allergic sensitization to food and inhalant allergens. Combining cereal with baby breast milk or formula may help ease your baby’s first solid-food experience. In a bowl or cup, mix 4 to 5 tablespoons of milk, with 1 to 2 tablespoons of single-grain cereal e.g. baby rice. Warm it, but always test the temperature. At first, try giving your baby solid food for only one feeding each day. If she will not eat it, try introducing it again in a few days. Choose a time of day that is the least stressful for you, and a time when your baby is not too hungry. Many parents find mid-morning or mid-afternoon an ideal time. Every baby is different, but yours will let you know how much she wants to eat and what she likes and dislikes. She also will eat different amounts on different days. When introducing solid foods, begin with single-ingredient foods. Wait three to five days before introducing each new food to confirm or dismiss any concern about allergies. Most pediatricians recommend starting with a single-grain cereal e.g. baby rice, because it is easier for babies to digest. Once your baby has tried a single-grain cereal, and when you are both ready, you can introduce her to single-ingredient foods, such as pureed fruit or vegetable. Here is some basic information to help you and your baby get started. Is your baby ready for single-grain cereals? Hold her head up and turn away when full. Take food from a spoon and learn to swallow. Start with a small amount and increase gradually. Even a teaspoonful is enough for some beginners. Start with 4 to 5 tablespoons of breast milk or formula mixed in a bowl with 1 to 2 tablespoons of rice cereal. During the first feedings of cereal, babies usually respond better to a thinner consistency. 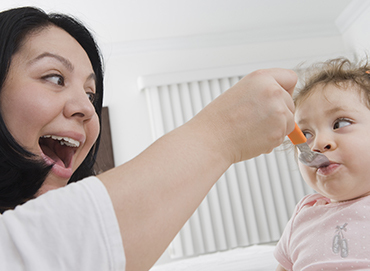 Put a small amount of warm cereal on the tip of a rubber-coated spoon and place it in your baby's mouth. Do not be surprised if at first the food comes right back out. Her natural instinct is to use the same mouth and tongue movements as she did when nursing or sucking from a bottle. As your baby transitions from a totally liquid diet of breast milk or formula she might not swallow much at first. As she gets used to eating from a spoon, you can gradually increase the amount and consistency, offering two or three feedings a day. Is your baby ready for single-ingredient foods? Take food from a spoon and swallow. 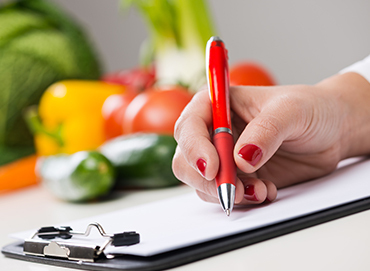 Introduce one new food at a time over the course of three to five days to check for food allergies. Start with a small amount and increase gradually. Even a teaspoonful is enough for some beginners. Do not feed your baby directly from the jar. The bacteria from your baby's saliva will make the food deteriorate. Your baby should only be fed when sitting up. Do solid foods help your baby sleep through the night? There is no scientific evidence that feeding your baby solids early in the evening helps her sleep through the night. Now that your baby is eating single-ingredient foods regularly, she/he probably wants to try more foods. From about 7 or 8 months , you can add combination foods to your baby's diet for extra variety and flavor. Here are some basic tips and guidelines to help you and your baby get started. Is your baby ready for combination foods? Eat a wide variety of single-ingredient foods. Eat solid foods about three times a day. Check the ingredients. If your baby was sensitive to any single food, make sure it is not a part of any combination foods. Introduce only one new ingredient at a time, waiting three to five days before introducing any other new foods to check for allergies. Keep single foods in your baby's diet. For example, offer your baby a favorite single-grain cereal from time to time for variety. Feed your baby breast milk or formula at each mealtime. It is a vital part of your baby's diet for the first 12 months. Do not worry if your baby refuses to eat, is fussy, or turns away. Try again later. Does your baby dislike a certain food? If your baby makes a funny face, it does not mean she/he dislikes the food. He will simply need time to adjust to a new taste. Use the new food for his first bite of solids for a few days. The first day you try new food, he might make a face and spit the food out. The second day he will usually swallow the first bite but might refuse the second. But if you continue this pattern, he’ll probably develop a taste for new foods — even strong-tasting vegetables. From about 8 or 9 months, you can keep adding new foods with more complex tastes and textures to your baby's diet. She might want more "grown-up" foods; however, be sure to offer a balanced diet by introducing Stage 3 foods. Here are some basics to help you and your baby make this transition. Is your baby ready for complex tastes? Even though talking is still months away, your baby might be telling you something. These do’s and don’ts will help you figure out your baby’s feeding signals, making the transition to solid foods as easy as possible for both of you. Here are some hints to help make mealtime entertaining instead of frustrating. DO remember that breast or formula milk is still your baby's main source of nutrition for the first full year. DON'T start solids earlier than about 4 months (unless your healthcare professional tells you otherwise). Your baby might not be ready for them. Introduction to solids prior to 4 months is associated with increased weight gain and adiposity. Make sure your baby is hungry, but not starving. A small "appetizer" of breast milk formula before feeding solids is recommended. Select a time of day that is the least stressful for you, and make sure you have plenty of time. Keep a sense of humor. Early feedings can be unproductive, challenging, and messy, but also quite comical. Learn to read your baby's signals. Feed your baby when you see these cues: he eagerly swallows every bite, follows the spoon with his eyes, and becomes impatient if not fed fast enough. DON'T continue feeding your baby if you see these cues: turns head away, refuses to open his mouth, or cries when you try feeding him. Wait three to five days to add each new food to your baby's diet. This is so you can detect any allergic reaction your baby might have to a certain food. DON'T season baby food. Babies do not need added salt or sugar. 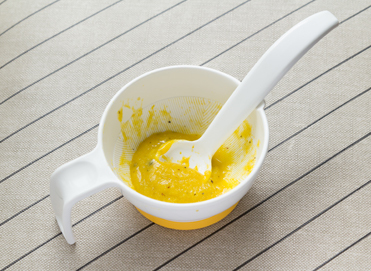 Serve baby food from a small bowl. Feeding directly from a jar can encourage bacteria growth. Your baby's saliva can make the food watery. DON'T put your baby to bed with a bottle. This can promote "baby-bottle mouth", a form of tooth decay. DON'T gently stir and test the temperature of any food from the microwave before serving. Make sure the temperature is warm, not hot. DON'T feed cereals or other solid foods through a bottle, unless your healthcare professional directs you to do so. Cereal in a bottle might cause your baby to gag or choke. DON'T feed your baby in a reclining position because of the danger of gagging or choking.